North Platte Alpacas is a small breeder farm located along the North Platte River, east of Glenrock, WY. Frances and Vicki both come from farming and ranching backgrounds and are committed to raise quality breeding and fiber herd alpacas. They wanted to utilize their small acreage and after doing some research decided to raise alpacas. Alpacas are easy on the land, simple to care for, have an awesome fiber to utilize and provide a stress free environment. North Platte Alpacas started about 7 years ago and currently has a herd of about 50 alpacas. North Platte Alpacas’ wool is not processed at the farm at this time, but Vicki began taking spinning lessons in March. The wool is sent to mini mills for processing into yarn and roving. Skirted raw fleece is also available for sale at the farm. 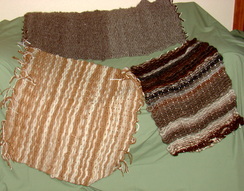 Colors range from the natural wool colors or the fiber is dyed into bright colors. 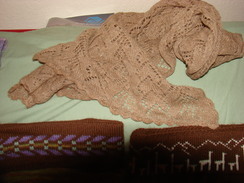 This hypo-allergenic, warm wool is used to make hats, headbands, scarves, rugs and wear well. 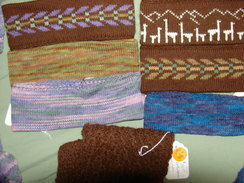 Products can be purchased at the North Platte Alpacas farm, on their website www.northplattealpacas.com, via e-mail northplattealpacas@vistabeam.com or by giving them a call.